In our latest article, we have given CA IPCC Revision Test Papers (RTP) and CA IPCC Study Material & Amendments applicable for Nov 2017. Today we are providing CA IPCC question papers of previous exams I;e last 10 attempts. Now you can download CA IPCC question papers of both Group – 1 and Group – 2, Accounts, Law ethics and communication, Cost accounting and Financial management, Taxation, Advanced accounting, Auditing and assurance, Information technology and Strategic management of previous exams i;e May 2017, Nov 2016, May 2016, Nov 2015, May 2015, Nov 2014, May 2014, November 2013, May 2013, Nov 2012, May 2012, November 2011, May 2011, Nov 2010 and May 2010. After study material and practice manual, everyone should solve previous exams question papers and suggested answers. Suggested answers of past few examinations give you an idea of what type of questions are asked in the examination and how to solve and present the solution for such questions in the examination. Solving the question paper in the examination situation will help you, not only in time management but will also give you the confidence to attempt different types of questions in the examination. So here we are providing, CA IPCC Question Papers of previous exams. Download below!! ICAI will be conducting CA IPCC exams from 2nd November 2017. Therefore, we will update download links of CA IPCC Nov 2017 question papers in the evening of respective exam dates. With the help of CA IPCC, previous exams question papers with solutions; you will get an idea about ICAI exam pattern. Do not neglect preparation of these question papers with suggested answers. If you are facing any issue while downloading these question papers, you can feel free to reach us at contactus@caprep18.com or on our toll-free number 1800-212-8575. 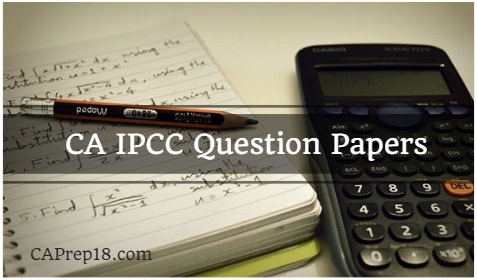 Share this article ” Download CA IPCC Question Papers Nov 2017 to May 2010 ” to your friends, who are going to write CA IPCC exam in May 2018 ! !